Not to be outdone by the number of full-frame mirrorless cameras being announced at Photokina 2018, Fujifilm has revealed the next "Super Full Frame" camera to join its GFX 50S. The new GFX 50R will be 25mm thinner and 145g lighter than its big brother. And it will be a lot cheaper too, with an anticipated price of $4,500 before tax when it goes on sale in November 2018. It pairs a 51.4MP medium format CMOS sensor with the X Processor Pro. 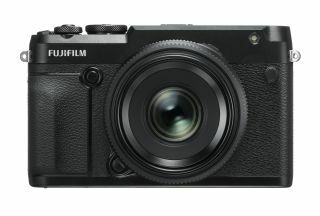 According to Fujifilm, the sensor has significantly better light reception capabilities than a 35mm sensor of comparable resolution, with micro lenses optimised to improve light-gathering performance and improved data-handling from the photodiodes. The X Processor Pro also provides access to Fujifilm’s popular Film Simulation Modes, allowing you to replicate the distinctive looks of specific film varieties from years gone by. The R in the name of the camera stands for Rangefinder - and is a nod to the fact that this camera looks similar to the Fuji GW690 6x9cm-format rangefinder camera that was in production during the 1970s and 80s. Control-wise, Fujifilm has equipped the GFX 50R with a focus lever to allow for quick adjustment of focus point, but has pared back a few of the buttons in favour of more grip space for a better hold on the camera. As you’d expect from Fuji, the controls are dial-led, with two aluminium dials on the top. The magnesium-alloy body is also weather-sealed in 64 places and can operate in temperatures as low as -10℃. Another nice addition – this is the first member of the GFX family to support Bluetooth connectivity for fast image transfer. The camera will be launched with a new lens for the GFX mirrorless system - a 50mm f/3.5 lens, which when paired with the GFX 50R will be, Fujifilm claim, the world's lightest digital medium format combo. Also announced at the same event, was the development of a new 100 megapixel model in the GFX system, the GFX 100S, which will go on sale in 2019.